Two sisters, Cecile Mulombe Mbombe—cinematographer, and Pauline Mulombe—filmmaker, talk about their lives, their experiences, and the film, Everyone has Reasons to be Angry with their Mother, which they made together. Film synopsis: In the span of 48 hours, three Afro-Belgian sisters living in Brussels are forced to face their many hang-ups and their darkest secrets. Their African mother, confronted with the opposing forces of Western culture, must deal with her daughters’ realities. Cecile, Pauline, could you both tell us about yourself, and as Belgo-Congolese women? I was born in Kinshasa and even though I grew up in Europe, in Brussels, I have always felt close to Congolese culture, particularly the music, for which I have fond sentiments. I attempt to keep up to date on events happening in the Congo. It can be difficult, but thanks to the Congolese Diaspora, which is very visible in Belgium, I am able to stay in touch and not close my eyes to the current realities. When possible we try to be involved in activities in support of the women and children who are victims of the war. I admit that I do not label myself only within these two countries, since I feel a bit like many of this generation, as a world citizen. I rather like the idea—thanks to the Internet—that I have influences from the four corners of the earth, from diverse backgrounds (Africa, Europe, America, Asia). My studies and my profession have allowed me to travel across Europe, make stops in North America, as well as the Caribbean and in Africa. And I have always felt at home wherever I am. In each context, I bring along a bit of my Belgian-ness spiced with my African side, which fits me very well. I was born in Kinshasa but I grew up in Belgium, therefore, I do not really remember the Congo. I spent two weeks in Kinshasa in 1994 and I have not returned since. I enjoy Congolese music and cuisine. I always feel a certain pride when a Congolese is recognized or makes a positive contribution to the community. I am happy and touched by all of the good news and the glimmer of hope that may come from the country. But with all that is happening in the Congo at the present, especially the war in the Eastern region, I feel sad, angry and a sense of despair. I am Congolese because I was born there, but I do not think that only my origins have influenced my behavior or my work. I think that our mother has given us more of a Catholic education than a Congolese upbringing. Perhaps she lacked the time because she worked and we spent the majority of time at school. At home we always spoke French. Besides what our mother taught us, I also learned through my studies, my friends, the music that I listened to, the films that I watched. My values are universal, which makes me Belgo-Congolese, and like Cecile, a world citizen. I think that to be Belgo-Congolese makes things easier. Though it is a sad reality that in order for Africans to travel and work they must have a European nationality or a double nationality. But in my opinion, whether it is in Belgium or in France, or in another host country, enough is not being done towards the integration of immigrants. What brought you to the world of cinema? What was your process? Cecile as cinematographer, Pauline as filmmaker? I‘ve had a passion for the image, for graphics since I was very small. I drew constantly, everywhere, on anything. Since then I have never let go of my pencil, which metamorphosed with time into the still camera and then the movie camera. It was a logical evolution that developed through diverse encounters and experiences. But the turning point came at the film school in Madrid where I obtained a Master’s in cinematography to become director of photography for cinema and television. Very quickly I specialized in light and shadow and cut my teeth on publicity sets as lighting technician for a film rental company in Colmenar Viejo, in Madrid. Upon returning to Belgium I took a somewhat "guerilla" path where I developed a great deal of versatility. In fact, I arrived right at the digital filmmaking boom. With reduced budgets I often wore multiple hats on the same set—lighting, assistant camera, cameraperson—increasing my experience in productions—from big to small budgets. Eventually I was assigned as gaffer for more important films. And finally I was able to work on my first short films as director of photography, notably Lula by Ladi Bidinga, which screened in festivals in Europe, and Africa, such as FESPACO, in 2009. Since I have always been an avid film buff, I wanted to work in the cinema industry, particularly in production. I did not know any school or university that proposed this kind of career path; most of the schools have courses for actors or technicians. Finally I learned about the Université Libre de Bruxelles [The Free University of Brussels] that offered a degree in cinema. In addition to courses in production I was able to study cinema history and also film analysis, as well as scriptwriting. With my diploma under my belt, I worked for two years as a production assistant for Kathleen de Bethune at Simple Production, mainly in documentary films, which I liked a lot, however I wanted to try my hand in another genre. I decided to go to London to work on fiction. I worked as a volunteer in no-budget films. By working in guerilla filmmaking I began to realize that I could actually do this and, so why not expend my energy in making my own films. "Everyone has Reasons to be Angry with their Mother", well, that’s an interesting title. What are its origins? I think that Pauline could better respond to this question than I. The title already existed when I first read the script and from the start the question was whether the title should stick. In the end, she did not yield and I think she followed her instinct because the title supports the film very well. The film tackles the question of identity, which is a very current theme in Europe at the moment. How did you focus on this issue in the film? I would say that my task—which was also producer—was connected to that of the assistant director, Stephane Collin. We both resisted the overused cliché of “the African”, “the Black”, but rather, we tried to be as realistic as possible in constructing the environment and the characters, without falling into the predictable images of “the African community”. We are trying to understand for ourselves what it means to be an African woman in Belgium. For us, she is modern, contemporary. In any case, this is what I try to visually transmit on screen. I specify African and not Congolese because the origins of the family is not defined. What is revealed is their common history with many other immigrant families, even if during the dinner sequence, the clothing and the dishes strongly resemble central African culture, more specifically the Congo. 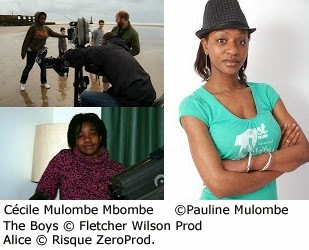 The actresses have origins from different African countries, and even in the technical crew there is a rich diversity. I think it was a great success to have brought all these people together, who live kilometres apart, to share time—and occasionally the intimate lives of the women—during the preparation and shooting of the film. Each crewmember brought her/his experience and understanding of things, which took us into debates that went far beyond what we imagined during the composition of the team. The question of identity is already resolved in the film because it is not its central theme. The protagonists, the daughters, do not have an identity problem. They respect their cultural heritage but they want to live their lives as they see fit. The film is located principally within the context of tolerance, indeed acceptance, by their mother, of their multi-culturalism and their reality. The youngest wants to enjoy herself and grow and develop by making the most of European social and cultural life. The middle daughter wants to utilize all of the possibilities available to resolve her problems, even if it means doing things that are unthinkable in her culture of origin, such as taking the birth control pill when still an adolescent. The oldest, even if she does not openly show her homosexuality, knows that she is 100% gay. Since she is the oldest she feels compelled to make sacrifices, knowing that her mother’s hopes rest on her and that she would never tolerate such an infringement on the values that she holds so dear. For me, the mother represents the African continent that must change its mentality, its behavior, in order to adequately coexist within the present realities of the world. If the mother would change her behavior a bit in order to really see things, she would not be in conflict with her daughters because a dialogue would be possible. Everybody, mother and daughters, would be much happier. Do you generally work together or specifically for this film? How did you actualize the film together? It was our first project together, even though in the past we assisted each other with our respective work. Admittedly, I do hope that I was not too much of a "despot". From the very start I tried to deal only with the technical side—the choice of the technical crew, the equipment and all of the tasks that entailed transforming the script to the realization of the film. Pauline dealt with the creative side, so her ideas are represented on screen—in terms of her vision of the actors’ roles, the film set, the mise-en scène. However, we selected the sets and filming locations and did the storyboard together. I worked in the same manner that I would with any other filmmaker, even though in this case I had a better knowledge of the filmmaker, since we have known each other forever [smiles]. We both wanted a quality work, even though the budget did not allow us to be really free to run the course of our fantasies. Nonetheless, we met the challenge and did not fall into taking the easy way out. We wanted at all cost to keep the ‘professional touch’ [stated in English] whether for ourselves or for the crew with which we worked. I am very happy to work with Cecile because I find her very talented. Right away I chose her as Director of Photography. I had already written the script and I had her read it. Since she liked it, I asked her to assist me in setting the project in motion. She has much more experience than I and perhaps it is true that she could have worn all the hats. She took care of the budget and the selection of the technical crew. Even artistically she gave me absolutely all that I asked for. I explained to her the type of shots, the camera movements and effects that I wanted. She understood me perfectly; she did the sketches accordingly and made it all a reality. I could delegate quite a bit because I knew that she wouldn’t do anything that I did not like. We spoke with the crew and actors in two voices, which I think made a relaxed environment. Since I am not very technical, when I said something in error, Cecile served as my backup, with much amusement from the crew. Only Cecile could know that when I said “green”, in fact, I meant “blue”. Monique Mbeka Phoba who herself is a filmmaker, acted in the film. So she passed to the other side of the camera. What was your relationship with her? What did her experience bring to the film? I have fond memories of working with Monique, a beautiful human experience. She brought humanity to the role of the mom, which has been very well received up until now. There were lots of questions during the preparation. There had to be a balance between the mom that she is in everyday life and the woman who, as we, lives this Belgo-Congolese duality. Therefore, the challenge was to find within all of this, the correct tone; and her “feeling” [stated in English] was the right one, and I must say that I am very happy with this collaboration and to have been enriched by her experience in life and as a filmmaker. It was a real pleasure to work with Monique. From the very beginning, she was interested in the subject. I could benefit from her way of dealing with diverse themes; she asked questions that made me think about the characters, and define them in a more precise manner. I was delighted because in spite of her experience as filmmaker, she allowed me to direct her and had a desire to learn, and experiment, which contributed a great deal. All the people with whom I talk about Monique say that she is fantastic and very natural, and I think that this naturalness is what the people in the film like. The film was selected at the Panafrican Film Festival in Cannes in 2010 and in the Short Film Corner at the 63rd Cannes Film Festival, how was it received? The reactions were very positive. Those who saw it found it to be a quality film and liked it a lot. We received a good reception in two festivals with two different audiences, which demonstrate the universal message of the film. I think this is a very nice reward and a response to those who want to box the film into a so-called African story. We recently participated in the Rob Knox Festival in England where the film received the prize for the best script. For the only film in a non-English language, it was equally rewarding. At the present, I would like to do a feature film. Personally I am continuing my adventure in cinematography and as cameraperson on other projects both audiovisual and cinematographic productions. I recently shot for a short film about madness in huis-clos. It was a rather enjoyable experience. In terms of future projects together. Pauline is preparing a feature, and well, why not continue the adventure together.